Facing Frederick is a well written, nuanced biography for middle grades that sheds light on both Frederick Douglass and the tumultuous times in which he lived. 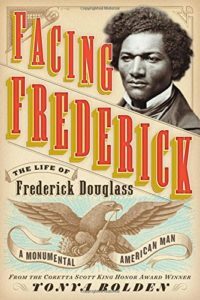 Facing Frederick: The Life and Times of Frederick Douglass by Tonya Bolden. Harry Abrams, 2018. 208 pages. Frederick Douglass, the “lion,” dominated 19th century American abolitionist efforts and with good reason. He lived what he believed passionately, eloquently, and tirelessly. Born as a slave, he eventually bought his freedom (thanks to a couple of British benefactresses). Frederick was a gifted orator and produced newspapers, essays, speeches, and myriad other literary offerings constantly in his efforts to waken the American population in general, and his fellow African Americans in particular. Frederick would not rest as long as any man–regardless of race–was disenfranchised or persecuted. The Emancipation Proclamation was a step in the right direction, but the fight wasn’t over: The vote! The vote! And then he fought against the South’s interpretation of Reconstruction, petitioning each new President for greater equality measures. 2018 marks the 150th anniversary of the 14th Amendment’s inclusion in the Constitution. It seems fitting, then, that the man who worked faithfully and fearfully towards that goal is honored in this excellent new biography. 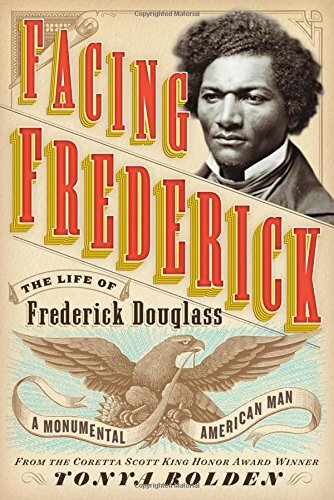 Facing Frederick is an outstanding biography: Bolden’s meticulous and thorough research is evident on every page. Frederick’s love of photography is exhibited in the many photographs of him that grace the pages. 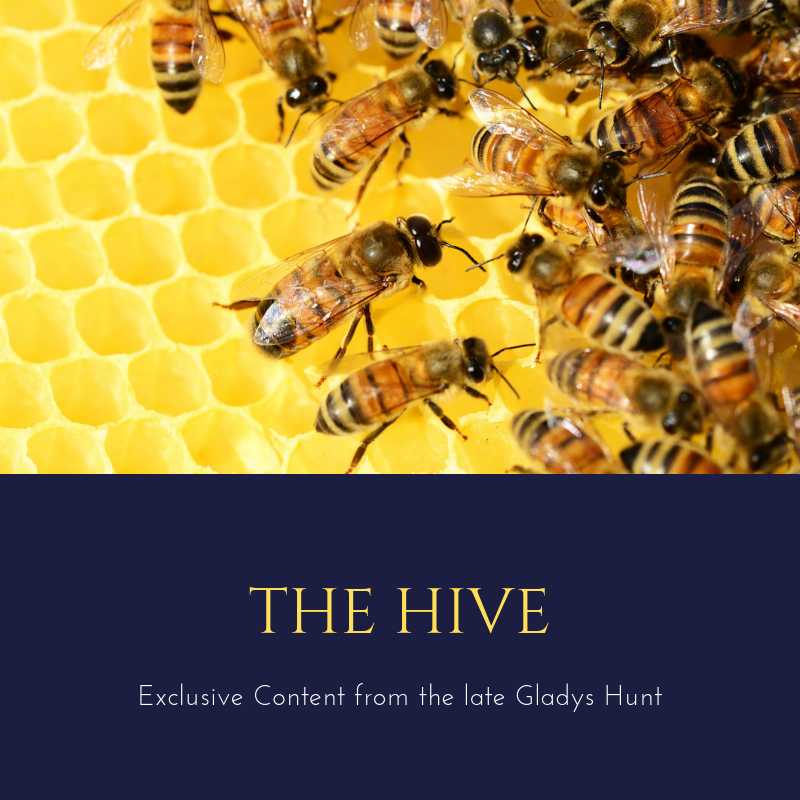 Quotations, facsimiles of his writings and period newspapers, a timeline, detailed source notes, and a thoughtful author’s note round out the authenticity of the information. Bolden’s narrative style matches the sober, articulate, yet passionate, style of Douglass himself which adds much to her introduction of this famous figure. As bombs, bullets, and bayonets bloodied and blew away lives, Frederick ratcheted up his rhetoric on slaveholders. Perhaps Bolden’s greatest strength as a biographer lies in her skillful handling of the nuance of the times. Even President Lincoln is presented as a complex case; no one is perfect, even Frederick himself. Yet, she shies away from making Frederick so complicated that we aren’t sure whether he’s a hero or not. No, Frederick comes through loud and clear as a hero who, despite his faults, stood up to his critics, fought for his beliefs, and lived out what he preached. Bolden alludes occasionally to Frederick’s faith in God, but she includes his faith in humanity in the same breath. It’s unclear from this biography what the extent of Frederick’s Christian faith was, but nor is his faith denigrated. I highly recommend this biography, but do know that it is slightly academic. Young readers will benefit from it, but they might not pick this up for “fun” reading. Of note: some parents may wish to know that Bolden mentions rumors of Frederick’s mistress at one point. She discounts those rumors and handles it tactfully. This title is on our Black History Month Nonfiction Book List. Abraham Lincoln & Frederick Douglass is another good read about this famous man. We also recommend The Boy Who Became Buffalo Bill if you’d like another biography about a famous man who lived during the same time period!